The wooden boards are used for thousands of years for preparation and serving of food and is an integral part of kitchen utensils. Because it is safer and more hygienic than plastic, and that’s a fact. In addition, each board has unique texture and this adds originality to the product. Bring warmth and coziness with ecological natural materials in your kitchen. The widely considered opinion that the wooden board are not hygienic is FALSE. boards with cutting surface against the fibers of the wood (END GRAIN) not blunting the knife, so the blade is slid between the fibers. Both have advantages and disadvantages. It is a matter of judgement, what boards you choose depends on their use, your taste and preferences, as well as how much money you are willing to invest in them. In my opinion a household should have several different boards in size and appearance, a minimum of two pieces. This will facilitate greatly your work in the kitchen. EDGE-grain boards are the most common, known from antiquity, they are sold everywhere in a variety of sizes and thicknesses. They are made of a variety of solid woods, either made from a single piece (easily get distorted) or multiple pieces, may be thin and light, and last but not least, cheaper, at least most of them and absorb less liquid. I personally do not recommend inexpensive bamboo boards (bamboo is a grass not wood. Bamboo is among the fastest growing plants, aн economically profitable material), such boards are too hard (blunt knives quickly) and is easily getting unstacked and you never know how much food-safe is the glue when directly contacting the food (I mean the cheap ones). The models that we offer are mostly made from Bulgarian oak and beech wood glued only with titebond III – one of the best water-resistant adhesives and food safety glue in the world, featured specifically for kitchen boards. The boards are impregnated with mineral oil several times. 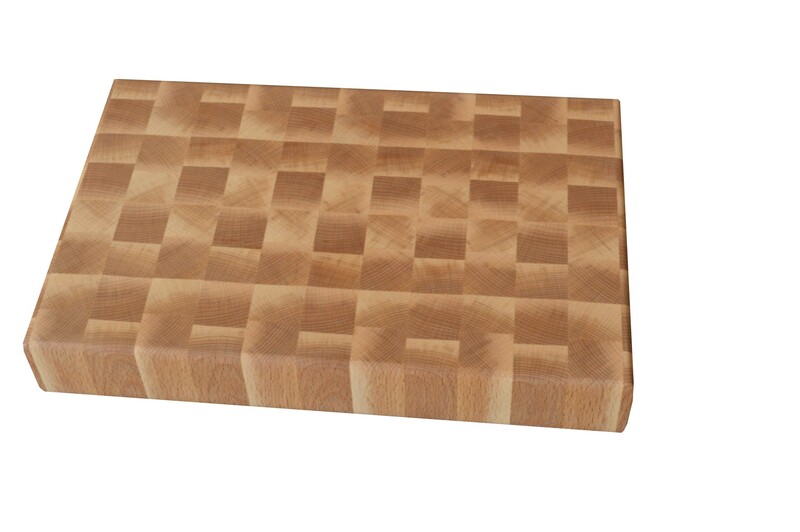 END grain boards – These boards got popular lately and are often used by professional chefs. They’re made of multiple pieces of hardwood, do not blunt the knife as much as others since the blade is slit between the fibers. The end-grain boards do not scrape the surface as much as conventional boards. They also do not bend as much as the ordinary (longitudinally glued boards) edge grain boards. Unfortunately END GRAIN boards are more expensive, because of the difficult production process (multiple pieces) and greater material consumption, can only be thick so as not to get splitted. Their support is more difficult. It is advisable to impregnate with mineral oil from time to time, so as not to crack and does not absorb liquids through the pores of the wood, which are exposed directly to the food. They’re heavy, which makes them more difficult to wash and handle. Our production of End Grain Boards is with very high quality and precision, which is extremely important for this type of boards, because the slightest defect in time becomes a problem. With proper use and maintenance, this type of boards safely withstand many years of constant use. You can order the Board of your design and size. For more information or help in choosing the Board please call 00359 894 30 65 76 will be happy to help.